Want to know how pulp becomes a product? Just follow the fiber. 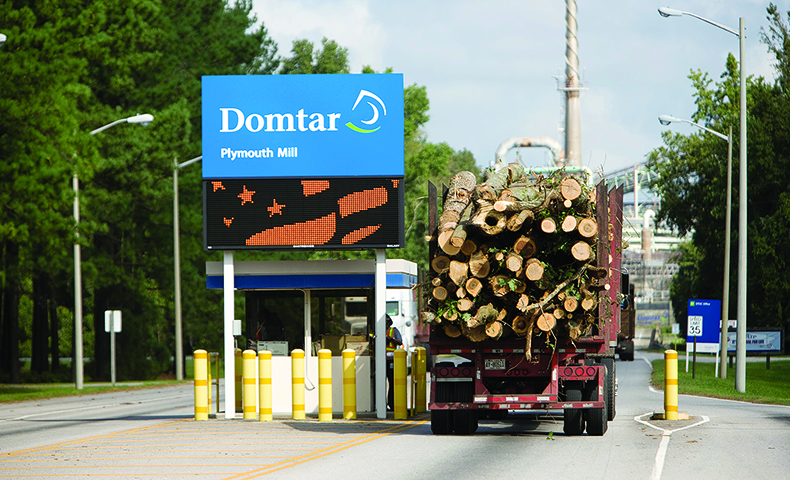 A log truck lumbers down North Carolina’s Highway 64 toward Domtar’s Plymouth Mill, loaded with 27 tons of pine pulpwood. It’s the kind of softwood fiber that’s perfect for making the high-absorbency Lighthouse Fluff Pulp used in the Attends® Soft incontinence pads produced at Domtar Personal Care’s Aneby, Sweden, plant. But a lot has to happen before that fiber becomes a product that’s suitable for consumer use in New Zealand. Let’s follow the fiber for a behind-the-scenes look. After the logs arrive at the mill, they’re offloaded with cranes into a debarking drum, where the logs are stripped of bark. The pine logs’ first stop is the mill’s wood yard, where Wood Procurement Manager Fay Raynor oversees the first part of the process. Raynor has worked at Plymouth Mill for 30 years and has supervised the wood yard since 2011. She enjoys a long-standing rapport with the many loggers who arrive at the mill each day, and she appreciates the opportunities her job has afforded her. “I really enjoy working with vendors and loggers and being able to explore the Eastern North Carolina landscape,” she says. 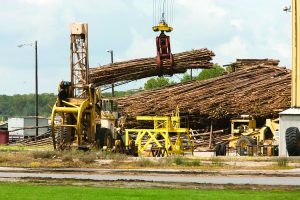 After the logs arrive, they’re offloaded with cranes into a debarking drum — a large-diameter drum similar to a giant clothes dryer. As the drum turns, the logs tumble against each other, and the resulting abrasion removes the tree bark, leaving behind smooth, clean logs. After the logs are debarked, they’re loaded into the chipper where they’re processed into wood chips, which are sorted and screened by size. Chips that are too small to be made into pulp are combined with the recovered bark and burned as fuel in the mill’s boilers. 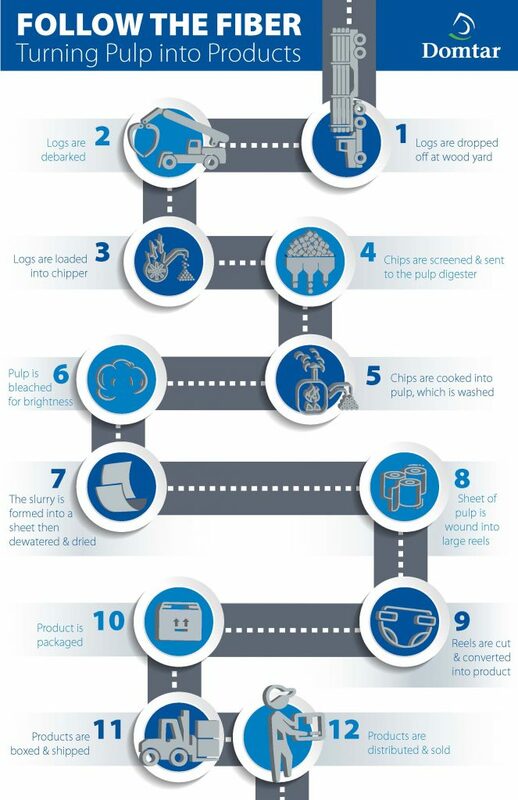 Chips that are the right size are placed into a bin and sent to the pulp digester for the next part of their journey. Plymouth Mill’s pulp digester turns wood chips into wood pulp. The process takes eight hours. Follow the fiber as Marty Barfield, Plymouth Mill’s pulp production manager, oversees the next steps. He’s been with the mill since 1989 and has supervised pulp production for the past five years. The pulp digester is similar to a large pressure cooker, which mixes the wood chips with chemicals and steam. Over a period of eight hours, the digester separates the wood into two parts: lignin, the natural glue that holds wood fibers together, and cellulose wood fibers, the key ingredient for the absorbent part of our Personal Care products. Barfield says strong process control is essential, particularly at this stage. “Process control at the digester is critical because everything stems off that,” he says. 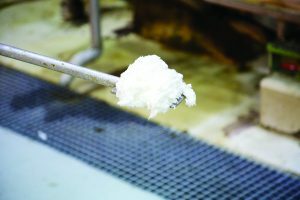 Next, the cellulose wood fibers are rinsed for approximately four hours to remove the cooking chemicals and send them through the mill’s recovery process. The washed chemical solution is called weak black liquor and contains lignin. To prepare the weak black liquor for further use, water is evaporated, resulting in a strong black liquor mixture, which looks like tar and is burned in the mill’s chemical recovery boiler for energy. The rinsed cellulose wood fiber yields wood pulp, called brown stock, which is routed to the bleach plant. There, chemicals remove the last of the lignin and brighten the wood pulp to its white color. Pulp slurry is transferred onto a moving plastic screen, where water drains by gravity. This process creates an endless sheet. After about 10 hours of bleaching, it’s time to form the pulp fibers into a usable sheet and dry it. Pulp is prepared for sheet formation by adding water to create a slurry that is 99 percent water and 1 percent fiber. This slurry is transferred onto a moving plastic screen where the water drains by gravity, allowing an endless sheet to be formed. Most of the rest of the water is removed from the sheet through three phases of mechanical pressing. 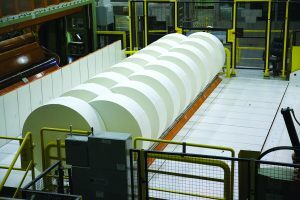 Finally, the pulp sheet moves through a series of steam-heated dryers that drive moisture out until the pulp composition reaches 92 percent fiber and 8 percent water. Allen Phelps, a 40-year Domtar veteran and Plymouth Mill’s planning and transportation manager since 2011, takes over at this point in the process. Long sheets of pulp are wound into large reels, each weight approximately 45 tons — the equivalent of six elephants. The long sheet of pulp that emerges from the dryers is wound into large rolls that weigh about 45 tons — the equivalent of six elephants. 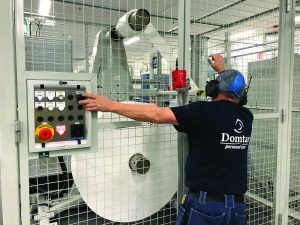 Each roll is transferred to a winder where it’s unwound, cut to customer specification and rerolled into much smaller rolls that weigh between 1,000 and 2,000 pounds. Then, the rolls are wrapped before being sent via conveyor to the warehouse until it’s time for shipping. “This is a very detail-oriented job, and it requires a very detail-oriented person,” Phelps says. He determines when to send a clamp truck to the warehouse to pull a specific pulp roll off the shelf and place it in a 40-foot shipping container. After the container is full, a courier truck drives it north to the shipping ports in Norfolk, Virginia, where it’s loaded onto a cargo ship bound for Europe. 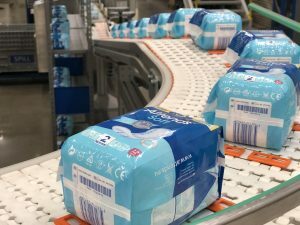 After a 4,000-mile journey, rolls of pulp arrive in Gothenburg, Sweden, where they travel 100 miles by truck to the Aneby plant, arriving after six weeks in transit. The operations crew loads absorbent cores and other materials to make the final Attends Soft product. 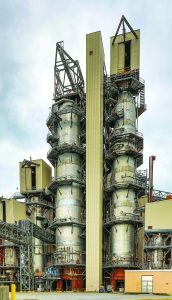 Follow the fiber to Aneby, where the pulp sheet goes into a mill that grinds it into fibers before it is mixed with super absorbent polymer. Then the pulp mixture is moved to a formation unit that makes top and bottom absorbent cores. The operations crew loads the cores and other materials (top sheet, back sheet, elastics, release paper, glue, ink, acquisition layer and single wrap) into the line, a machine that’s more than 50 meters long. The materials are cut, printed, shaped into a pad and then folded. Finally the pads are packed into bags according to customer specs. Conveyor belts transfer the packaged product to be boxed, loaded onto pallets and prepared for shipping. Conveyor belts whisk boxes of finished product to the warehouse, where robots pack them on pallets. More conveyors take the pallets to Aneby’s high-bay warehouse, where an automated system matches up customer orders with the pallets in the warehouse and pulls them to staging lanes. We ship products from Aneby to more than 30 countries — from Denmark to Dubai — each with unique requirements. Our logistics team ensures that each order is filled accurately. 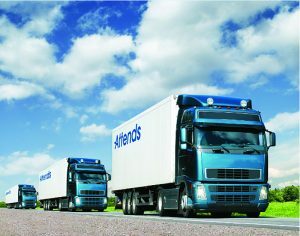 Warehouse operators load the products into container trucks that can hold 34 full pallets of product. Because these products are relatively lightweight compared to rolls of pulp, for example, the space around the pallets is manually packed with individual boxes to maximize cargo efficiency. Follow the fiber and you’ll see the truck head back to the port of Gothenburg, where the container is loaded onto a ship. It’s transferred to a much larger vessel in Holland for the 50-day sea crossing to the customer in New Zealand. Containers are packed with boxes of product and driven to a port to be loaded onto a ship, which will take them to our customer in New Zealand. In New Zealand, our products are distributed and sold through a number of healthcare and retail outlets. This includes long-term care facilities, hospitals, community nursing visits, pharmacies and stores specializing in mobility. The humble fiber at the core of this story has undergone an incredible transformation during its journey of more than 8,500 miles. Aren’t you glad you took some time to follow the fiber? Also, check out this brief video on how our pulp gets turned into products.